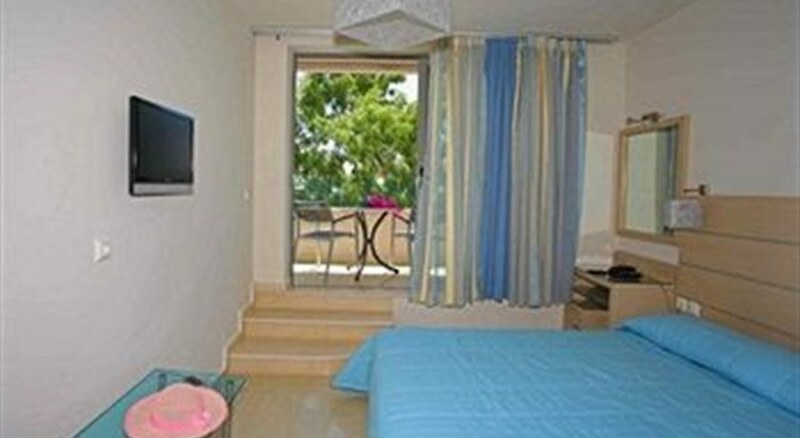 This hotel stands on one of the most beautiful streets in central Georgioupolis, just about 60 metres from the beach. Located on an idyllic, green bay, this quiet, traditional village offers guests plenty of opportunity for shopping and entertainment. The property lies around 22 km from Rethymno town and 35 km from Chania. 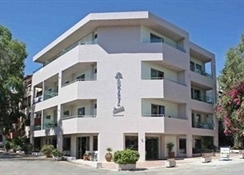 Chania Airport is about 35 km away.--This family-friendly beach hotel features modern architecture and is made up of 3 adjacent buildings comprising a total of 77 rooms. In the main building guests will find the reception, a spacious lobby and a veranda with spectacular views of the sea. Further facilities on offer to guests at this air-conditioned establishment include a lobby area and lift access suitable for carrying a wheelchair. There is a restaurant and guests will appreciate the wireless Internet access.--The rooms are spacious, comfortable and bright. All come with a private bathroom with a bathtub and a hairdryer. They are equipped with a telephone, satellite TV, a safe (charges apply), a fridge, individually regulated air conditioning and a large wardrobe. All rooms also feature either a balcony or a terrace.--This hotel features an outdoor swimming pool with a sun terrace.--Guests may select their breakfast from a buffet and evening meal is also available in buffet form.